(TibetanReview.net, Oct12, 2018) – The Congressional-Executive Commission on China (CECC) of the United States has on Oct 10 referred to the deteriorating human rights situation in Tibet, as in China, and called on lawmakers and the Trump Administration to push for reciprocal access to Tibet and renewed dialogue between China and the Dalai Lama’s representatives. The occasion was a press conference called to release the commission’s Annual Report 2018. 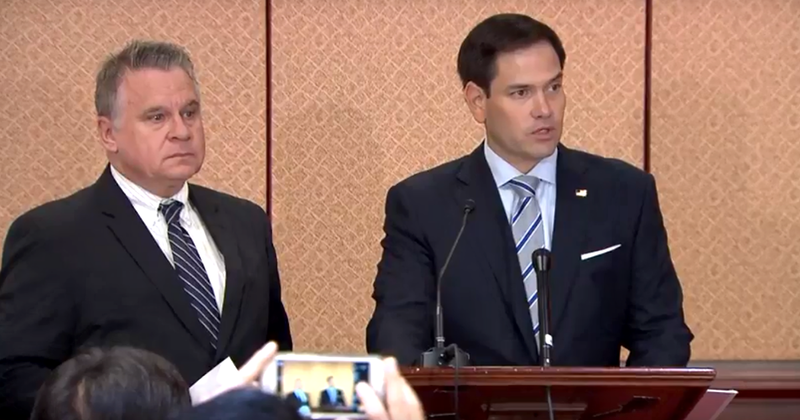 The discussion of the report, held in the US Congress, was led by the commission’s chairs, Senator Marco Rubio (R-Fla.) and Representative Chris Smith (R-NJ). The report expresses concern that no formal dialogue had taken place in nearly nine years between the Chinese government and representatives of the Dalai Lama even as the situation in Tibet continued to deteriorate, with repressive tactics having become commonplace. The report notes that between 2007 and 2016, domestic security spending in the Tibet Autonomous Region grew by more than 400 percent. It also urges the US to encourage “the Chinese government to respect the right of Tibetans to travel domestically as well as internationally, and to allow access to the Tibetan autonomous areas of China to international journalists, representatives of the United Nations and non-governmental organizations, US Government officials, and members of the Tibetan diaspora living around the world”. Rubio has expressed confidence that the Senate would pass the bill for Reciprocal Access to Tibet Act unanimously before the end of this year and that President Trump would sign it into law. The House of Representatives passed it just recently. The report also refers to the issue of religious freedom and says the Communist Party and the Chinese government “continued to regulate Tibetan Buddhism and its practices in an effort to strengthen their control over Tibetan Buddhists”. It calls on members of the US Congress and Administration officials to encourage China to respect, as a matter of religious freedom and as recognized under Chinese and international law, that the decision regarding the Dalai Lama’s succession or reincarnation must be reserved for the current Dalai Lama, Tibetan Buddhist leaders and the Tibetan people. The report “not only sheds light on and clearly documents the authoritarian rule imposed by China in Tibet and beyond, but also provides concrete recommendations to the US government on how to effectively counter the efforts by Beijing to consolidate its power, completely disregard the rule of law and avoid being held accountable to its own citizens,” President Matteo Mecacci of the Washington-based International Campaign For Tibet has said Oct 10.